Rick Husband was the first shuttle pilot to dock with the International Space Station, which now includes the U.S.-built node, Unity, and the Russian-built functional cargo node, Zarya, according to a NASA news release. The crew transferred about 10,000 pounds of equipment to the ISS interior and installed two cranes on the ISS exterior during a space walk. "It was the most fantastic journey of my entire life," Husband said. "It's an experience I won't forget soon and I hope to repeat it in the not-too-distant future. I finally realized, and it became my desire, that I would be the best man that I possibly could for God; that I could be the best husband that I could for my wife, Evelyn; be the best father that I could for my children; and to do everything I can to make sure that they know about Jesus. I hope that they come to a point in their lives when they ask Jesus to be their Savior. I think if I could do that, and at the end of my life I look back, it would be what really mattered to me, not whether or not I was an astronaut or anything else." -- Rick Husband, Commander of Space Shuttle Columbia. Right Priorities: Rick Husband's priorities ring out loud and clear: Jesus, spouse, children and job in that order. Not many of us can say our priorities have always been as biblical. He spoke the above words at the First Presbyterian Church in Amarillo, Texas in 1999 after Husband had made his first shuttle flight to the International Space Station. He was explaining to a home-town congregation he had once been a member of, how he had tried three times to realize his goal of becoming an astronaut and finally turned the whole thing over to God: "For a long time, I wanted to (be an astronaut) for all the wrong reasons. I wanted to do it for selfish reasons -- like I thought that would be a neat thing to do . . . Several years ago, God brought me to a point in my life where I was able to give that up and realize what my desires really were." Then, on his fourth try he was accepted -- on God's terms. Submission to God is the most important, and perhaps most difficult thing about following Christ. 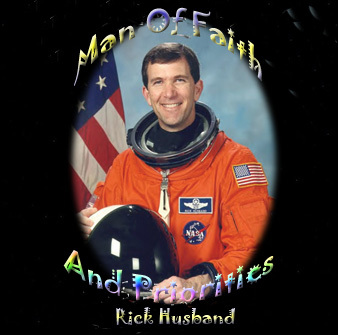 Though Rick had planned to become an astronaut from the age of 4, and had tremendous drive to accomplish everything he set out to do, it took him four tries to become accepted by NASA. Then he turned it all over to God and let Him take over. Jesus First: He and fellow Columbia crewman, Michael Anderson were members of Grace Community Church in Clear Lake near Houston. Their pastor said both men were strong, born again believers and there is no doubt as to where they are today. The pastor also said that Husband had hoped to lead Israeli crewman, Ilan Ramon (a non-religious Jew) to the Lord. We'll never know the outcome of that this side of heaven. Brothers, we do not want you to be ignorant about those who fall asleep, or to grieve like the rest of men, who have no hope. We believe that Jesus died and rose again and so we believe that God will bring with Jesus those who have fallen asleep in him. -1 Thessalonians 4:13-15 NIV. Concerning the Space Shuttle in context of God's Creation, Rick made these comments in 1999 at First Presbyterian inAmarillo, "The space shuttle is by far the most complex machine in the world. sorry your browser doesn't support java When you think about all the thousands of people it took to sit down and design this machine - the main engines, auxiliary power units, the hydraulics, the flight control systems, the reaction-control jets, the solid rocket boosters, the external tank that fuels the main engines, the crew compartment with all the controls and how we control the vehicle, and all of the time that was spent to put this thing together and make it work. It's to me, inconceivable that you could take a look at the universe and think that it just all happened by accident. There is no doubt in my mind that God had a very specific and complex plan that He put into work when He created the universe. Inside the vehicle are seven astronauts, each one of them is more complex than this vehicle we went up in. God is an awesome God." Spouse Second: Neighbors of the Husbands in Amarillo have all said what a family man Rick was. His former neighbor Bob Batchelor says, "We saw what kind of father he was, what kind of husband he was. With as busy a schedule as he had, he never neglected them. The time he spent with them was top-quality time." Presbyterian pastor, Dr. James R. Carroll who married them said, "Rick and Evelyn were very devoted Christians and lived their faith . . . I did some counseling and found them to be well-suited for each other and very much in love and committed to each other." When it was announced he would be on the 1999 Shuttle flight, Rick said, "My wife Evelyn has supported me in this endeavor since we first met in 1977." Children Third: "It's something that I wish I had learned a lot earlier, but I'm certainly glad I learned it when I did . . . because on this (1999 Shuttle) mission, it was a fantastic trip and amazing experience but when I think of the times when I've gotten to tuck my daughter in at night and sing to her and have her ask me questions about things that she's thinking about, or when our little 3-year-old son runs in completely naked to give me a kiss after his bath, I think I wouldn't trade any of those things for a ride in space because it wouldn't be worth it." - Rick Husband, August 1999. Job Fourth. Elementary and high school classmate, Justin Stiff says, "He was excellent in everything he did." Former neighbor, Batchelor says, "He loved what he was doing. He was just totally professional, and he had the brain on him and the body to stand the training. He was just a total professional. I can't think of anybody that would know more about what he was doing today than he would." Rick loved to sing and was good at it. He sang solos at weddings and funerals and he sang in the choir. He said, "It also give you a feeling of almost release, in my particular case, because, I'd say, very relaxing. And then, especially with some of the songs that we sing in church, just being able to sing a song to tell God how much I love Him, it just feels great." This life is only a short prelude to heaven. What song is your life singing? Tragically, Rick Husband's second assignment as a shuttle pilot was the 16-day Columbia mission which ended in disaster on February 1, 2003 when the craft broke apart upon re-entry through the Earth's atmosphere, killing all seven astronauts aboard. Rick Husband was a religious man who spoke publicly about his religious faith and beliefs and the impact they had on his life is indisputable. God gives the best to those who leave the choice to Him. Thank God for what you have; trust Him for what you need.